Mushrooms are here to challenge the “reach for green, avoid white” nutritional rule of thumb. Depending on the type, mushrooms can be a good source antioxidants like GSH (which helps prevent cell damage and reduce inflammation) and ERGO. If “keto comfort food” sounds like an oxymoron, think again. Check out this recipe for low-carb, keto pepper jack cauliflower. 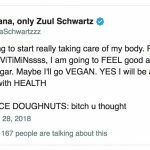 Delve into the refrigerators of fitness influencers, trainers, and models and hear their fitness/ nutrition advice for 2018. Try this compound strength training exercise to get an upper body workout that also engages your core.